Gym Badges in Pokémon Go are collectibles which serve to represent your dedication to specific Gyms. Each activity you participate in at a specific Gym will award you Badge EXP as you work toward higher Gym Badge tiers. Each Gym has a separate Badge, with a separate EXP bar. Only a progress bar is displayed, so you won't be able to see your actual total Badge EXP. You’ll gain items and Trainer EXP for spinning a Photo Disc at a Gym, but you won’t gain any Badge EXP. The main purpose of raising your Gym Badge tier with an individual Gym is to receive additional items when spinning that Gym’s Photo Disc. You’ll also receive slightly more Trainer EXP when spinning a Gym’s Photo Disc, based on the current tier of your Badge. Additionally, you can increase your chance of obtaining an EX Raid Pass, which is used to participate in incredibly rare Legendary Raid Battles. You can view all of your Gym Badges by tapping your portrait and tapping the "List" option below the "Recently Visited" in the Gym Badges section. A green bar below each Gym represents its current Badge EXP, though you cannot check the actual EXP value. You can also see which Gyms your Pokémon are defending. Tapping on an individual Gym will show you a summary of your Gym battle activity, including your defending Pokémon (if one has been assigned), and stats including the number of victories at that Gym, the total time your Pokemon have spent defending, and the amount of Treats (Berries) fed at that Gym. If you want to see the correct totals for these stats, you'll want to tap each Badge individually, as swiping from left and right will often cause the stats to bug and show incorrect data. Name: Alphabetically sorts by the names of Gyms. Defending: Places the Gyms which you are currently defending at the top. Recent: Shows your most recently visited Gyms. Points: Sorts in descending order sorted by your Gym Badge EXP. The last option is most helpful, as it allows you to, at a glance, see which Badges are close to leveling. Additionally, you can tap on the map button at the bottom left to show all of the Gyms you've interacted with on a slightly useless proximity-based map, which is likely more interesting to check out if you happen to travel a lot. It's worth noting that the game will display only the most recent 1,000 Gyms you’ve visited, but old Gym data is never really lost. It just isn't displayed in the game’s interface at this time. 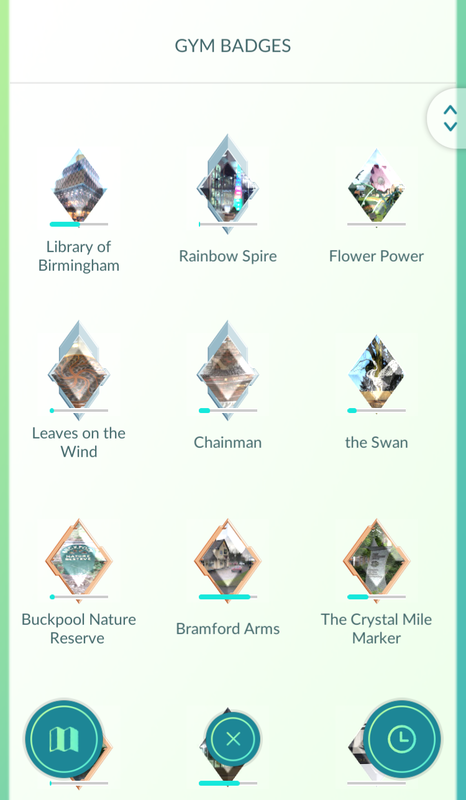 If you revisit an old Gym that has disappeared from your list, it’ll be moved back up to the top as your most recent, with its Gym Badge tier intact.